Disclaimer: in this post you are going to see a ton of photos of the Opera House. That's because this post is about... you guessed it, "photographing the Opera House." I'm aware that many of these look similar but hopefully they will give you some good ideas of what to shoot or where to shoot from if and when you decide to try it. My father was born in Australia and since a young age we have always traveled back to visit friends and family. Growing up I didn't understand the iconic nature of some of Australia's landmarks such as Ularu, the Sydney Harbour Bridge and the Sydney Opera House. We also never made our trips with the purpose of tourism, but rather to visit our friends and family. As I got older and into photography, I began to see some incredible photos of the Opera House on Instagram and I realized that these landmarks that were so common to me as a child were locations worthy of photographing pilgrimages. Eventually I decided I wanted to add photographing the Opera House to my Bucket List. A month ago my girlfriend and I took a trip to Australia to visit my friends and family and since it was my girlfriend's first time there we decided to do some touristy things to include visiting some of the iconic locations in Sydney. If you're looking for a cool place to photograph, Sydney as a whole is a treasure chest of great photography spots and many photographers there have entire successful galleries dedicated just to what they capture within the city limits. We ended up staying in the Radisson Hotel near "The Rocks" which is considered Sydney's downtown district, the area is littered with great restaurants, bars and markets. The hotel itself was in the perfect location and actually pretty swank for the price. I ended up taking photos of the Opera House on a few separate occasions and each time I ended up learning something new. Below are the different locations that I took photos from and the different shots are marked with a camera emoji, #cute. When we arrived in Sydney I couldn't wait to go out and take some pics. The first spot was found at point #3 on the map above. From here you have a great shot of the Opera House with a clean, stark background. I found that both position #2 and position #3 offer roughly the same shot at night but in the morning the location along that pier/warf or whatever you call it mattered as the sun comes up. I tried a few different options to include both long exposure and quicker shots but all of it had to be done on a tripod. One thing I thought looked really cool was the ferries that would go by during my shot leaving a very cool light trail. I would time it so that I would start the 30 sec exposure right before they entered the frame and then they would usually make it to the end of the frame by the time the shutter stopped. I did have an issue starting out where the exposure wasn't long enough for the boat to go the entire frame which made for some sub-par shots. You will notice that the above shot and the first shot look fairly similar. However, the first shot was taken early in the morning which had some amazing clouds. The above shot also shows some of the issues I had with the ferry lights. 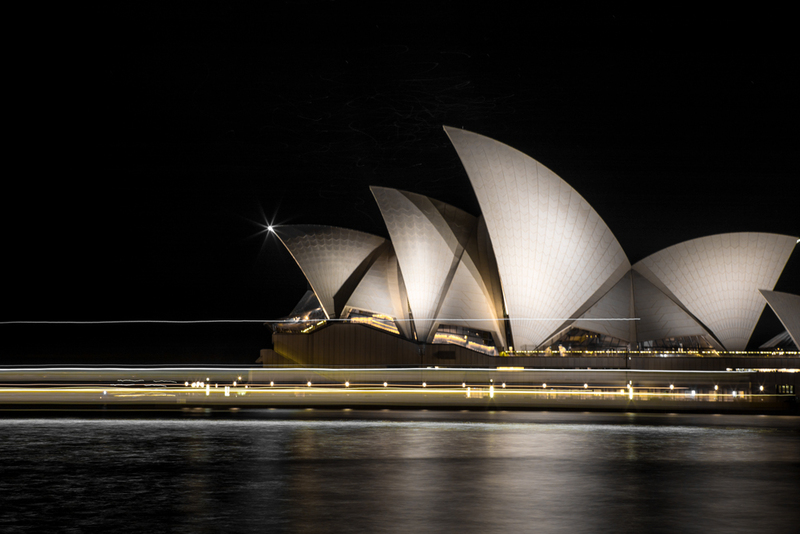 After walking away with some decent night shots I decided I wanted to give the Opera House a crack from the water. The next day we signed up for a Captain Cook sunset dinner cruise that started from the west side of the bridge, sailed under the bridge, past the Opera House and then turned around and came back. The tour cost $60 each but if photography isn't your thing it's actually pretty worth the spend given the quality of the food, the amount of alcohol we consumed and the views. As far as photographing the Opera House goes, the cruise offers some unique angles that you can't get without a boat. But, one issue I had with the cruise was that it started right as the sun was setting and the light began to fade rapidly. Because I was on a moving boat, my shutter speed had to be somewhat quick and I had to quickly bump up the ISO to keep up with the light, before long I was shooting some pretty grainy shots. The shot above was taken towards the middle of the cruise and as you can see the image was fairly grainy due to the high ISO. I also had a poor depth of field because I had to let in enough light to keep the ISO range somewhere in the realm of acceptabliity. I had the shutter at 1/60 sec which was about as slow as I could get it from a moving boat. The shot above and the shot below were taken from position #6 or somewhere in that area. Again, cool angles, but as you can see in the shots, I just couldn't make them into something worth selling or applying to a professional setting. *For a side tip, if you want to get some cool, cheap shots of the Opera House from the ocean you can always take them from either across the bay at Kirribilli Point or take the water taxi. The water taxi goes at all times of the day and takes a number of different routes past the pier. However, you will only get a small amount of time to capture the photo because the boat goes pretty quick so you better be on your camera game. The last attempt at photographing the Opera House came early in the morning. I used my Sun Surveyor App (available for iPhone) that will show me exactly where and when the sun would be rising. If you want to get into photography I would highly recommend it to help plan for sunrise/sunset photos. For the shots, the sun came up about where the sun emoji is listed on the map. The exact location where the sun rises will change through the year but I think it's safe to say that the best area to capture a good sunrise shot of the Opera House is somewhere between position #1 and 5. I arrived at position #3 well before sunrise and that's where I got some of my favorite shots. The first and last pictures on this page were actually taken about an hour before actual sunrise, just as the sun started to slightly light the horizon. The light made it possible to see the clouds that weren't visible at night which I think really enhances the shot. While I was at position #3 a local bicyclist/photographer showed up to takes some shots and recommended that I put the local warf in the shot. He was right, it made for a great foreground! After fully exhausting the pier I tried my luck at the pano shot once again with some better results. Again, the clouds added some interest to the shot. I think I will go back and re-edit to pop the Opera House a bit but all in all I am a lot happier with how it turned out. This one was shot from position #3. Ok, so last but not least (I know this post is getting long AF), I got some of the best shots as the sun began to crest. When it does, the Opera House lights up with some amazing colors. For the next shot I used the Tamron 150-600 which got some great close-ups that I don't think I could have achieved with the 24-105mm. I took the photo from position #4 just as the sun was starting to light up the windows on the southern end. There were also some people standing on the railing of the Opera House that added a bit of a story to the shot. From here I slowly tracked the sun as it began to rise, walking north along the warf, in hopes of capturing it right behind the Opera House. I will admit that I had higher hopes for this shot but in the end it was still pretty cool. I really wanted the sun-flare that you see below to be really prominent I did manage to capture what I was after. It's hard to photograph the Opera House in a manner that is new and unique. It's captured everyday all day so chances are someone has done your exact shot already. Although, I could give two shits if my shot looks like someone else's because I'm my own unique little snowflake... According to mum. If you do photograph the Opera House, sunrise, sunset or at dark are all great times, just make sure you bring a tripod. My zoom lens, the Tamron 150-600, offered some really cool shots that not a lot of people might be able to get. If all you have is a camera phone, I'd recommend getting close up. The shot from the pier that I mentioned wouldn't capture the amazing size and design. But if you make your way over to the house (which I should have done), you are bound to get some great, unique shots. You can get some great shots of the Opera House by taking water taxis, going to the other side of the bay or taking a dinner cruise. That's all I have, thanks for reading! Morning shot from the pier. I photoshopped in the moon and a few more stars because why not?